"There (are) hundreds of microorganisms in our mouths every day," says Gayle McCombs, RDH, MS, associate professor and director of the Dental Hygiene Research Center at Old Dominion University. Even plaque – the stuff you are trying to brush off your teeth – is a type of bacteria. None of this is cause for concern unless there is an unhealthy balance of bacteria in the mouth. Most of these germs already exist in your mouth so you probably won't get sick from them. However, if others use your toothbrush (or you use someone else's) germs can be spread. The thing to worry about is recurring illness. "When your resistance is low, that's when this becomes clinically important," he says. "In essence, you are re-infecting yourself," says Glass. You probably won't get an infection from your own toothbrush. Even if your brush is covered in bacteria, your immune system can usually take care of any bacterial invaders. However, you should still care for your toothbrush properly and keep it clean. The following slides discuss some ways to care for and store your toothbrush properly to minimize the chance of illness. Where you store your toothbrush in your bathroom is important. 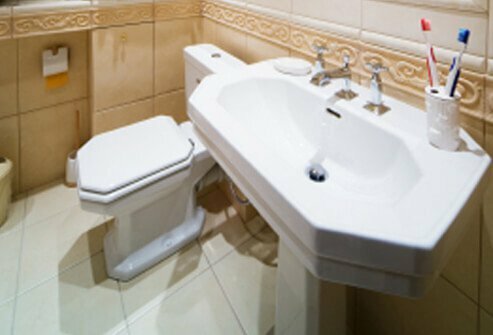 In most bathrooms, the toilet is very close to the sink, where most people keep their toothbrushes. Every time you flush, bacteria are released into the air – and you don't want that bacteria to get on your toothbrush. "It's just common sense to store your toothbrush as far away from the toilet as possible," says McCombs. Keep it in a medicine cabinet if possible, and always close the toilet lid before flushing to minimize the spread of bacteria onto your toothbrush. Toothbrush holders as well can pick up bacteria that are spread by toilet flushing. A study by the National Sanitation Foundation (NSF) found that toothbrush holders are the third-most germy household items (behind dish sponges and kitchen sinks). Remember to clean your toothbrush holder regularly to remove germs. Rinse your toothbrush thoroughly with tap water every time you use it. Let your toothbrush dry thoroughly between brushings. Don't use toothbrush covers, which can create a moist enclosed breeding ground for bacteria. Keep your toothbrush upright in a holder, rather than lying it down. Don't ever use anyone else's toothbrush, or let someone use yours. Keep toothbrushes separate. If toothbrushes touch they can swap germs. There are products available that claim to sanitize your toothbrush. Some use ultraviolet light; others are sprays or rinses. There are even brushes with built-in antibacterial bristles. While some of these products do kill some germs, there is no evidence using them will reduce your risk of illness. 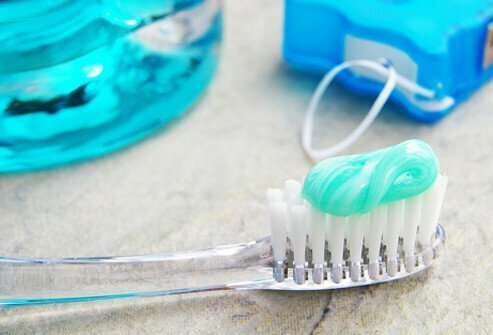 The American Dental Association (ADA) states soaking your toothbrush in an antibacterial mouth rinse after use may reduce the amount of bacteria on your toothbrush. Just make sure you do not try to sterilize your toothbrush in a microwave or dishwasher. 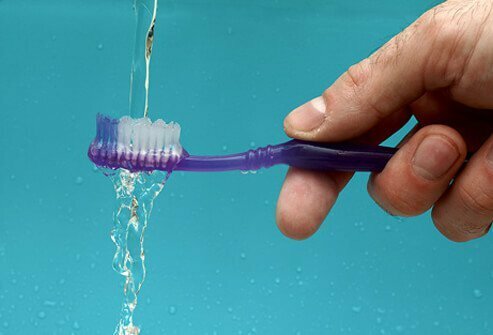 According to the ADA, most toothbrushes are not made to withstand these conditions and doing so might damage the brush and reduce its effectiveness. 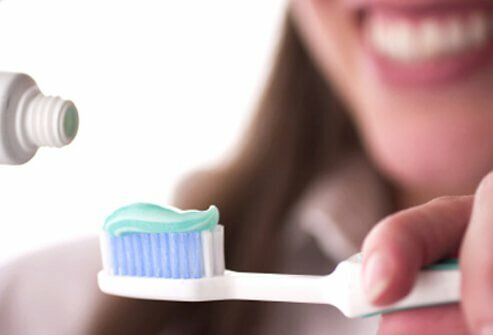 The ADA recommends replacing your toothbrush every three to four months, or more often if bristles become frayed, if you are sick, or if you have a weakened immune system. 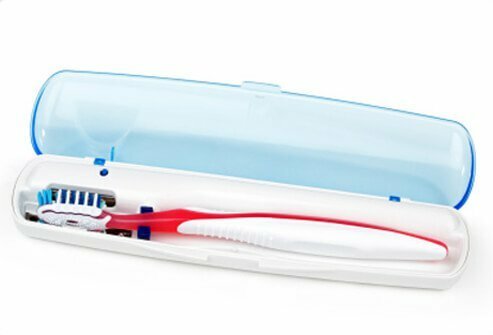 For an electric toothbrush, replace the head as frequently as you would a regular disposable brush. Children's toothbrushes may need to be replaced more often than adult brushes. Remember, "Bacteria cause gum disease, and decay, and bad breath," says dentist Kimberly Harms, DDS, consumer advisor for the ADA. Harms recommends brushing and flossing as often as possible, and rinsing your mouth with an antibacterial mouthwash before you brush to eliminate bacteria before they get onto your toothbrush. American Dental Association (ADA): "Toothbrush Care: Cleaning, Storing and Replacement." Centers for Disease Control and Prevention (CDC): "The Use and Handling of Toothbrushes." 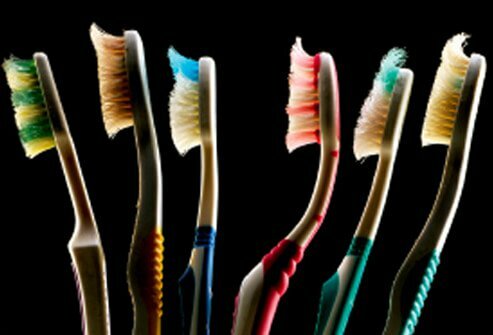 Lifehacker: "Ugly Truth About Your Toothbrush." 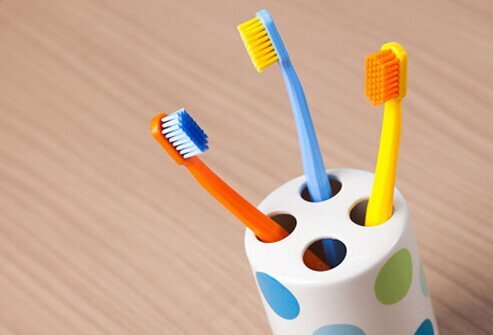 Nairaland Forum: "The Ugly Truth About Your Toothbrush - Health - Nairaland." NSF International: "2011 NSF International Household Germ Study." 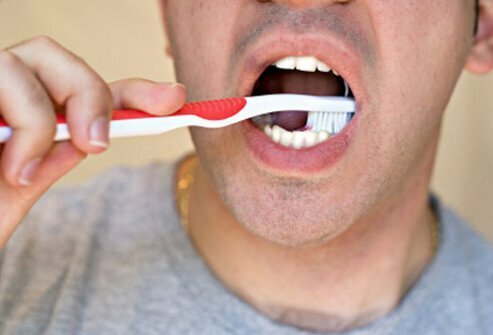 UAB News: "Clean Before You Clean — What’s On Your Toothbrush Just Might Surprise You."